Other Names: "Flyin Brian"(WCW), The Yellow Dog(WCW), "California"(WCW), "The Loose Cannon"(WCW), "Ticking Timb Bomb"
History: For nearly a decade, "Flyin" Brian Pillman was known as one of the most electrifying athletes in professional wrestling. Most agreed that he performed in some of the greatest matches ever seen, performing his best in the early '90s. Yet he never truly reached the peak of the mountain, falling just as he was about to head towards the summit. Pillman, right out of the gate, had to fight hard to live his life. He was born with throat cancer, which needed over 30 operations before the age of three to repair the damage. This left him with a raspy voice, one of his trademarks in the ring. Pillman's athletic career actually began in football, as he was an All-American at Ohio University. He would go on to compete in both the CFL and the NFL, including a stint with the Cincinnati Bengals. When an injury took him out of the sport, Pillman decided to head towards professional wrestling. He headed to Canada, training in Stu Hart's "Dungeon" alongside such notable wrestlers as Chris Benoit and Owen Hart. He soon learned the craft well, and made a strong team with Bruce Hart called "Bad Company". They would go on to win the Stampede International Tag-Team Titles twice, once while winning a major tournament. In 1989, Brian Pillman chose to leave Stampede Wrestling for the larger draw in the NWA. At the time, new talent was being sought, which included "Flyin" Brian. He worked hard during his first year with the company, gaining experience and fan recognition for his great matches, and soon moved up into the mid-card, feuding with Lex Luger over the NWA United States Title. Although Luger almost always came out on top, Pillman still earned respect from his peers for the matches he wrestled. He also joined with the Z-Man (Tom Zenk), forming a strong tag-team that stormed through more veteran teams like the Midnight Express and the Fabulous Freebirds to gain the NWA United States Tag-Team Titles. They would hold the belts for over three months before losing them to the Midnight Express. The beginning of 1991 saw Brian Pillman's fame start to grow. He concluded a long feud with Buddy Landell, in which he normally came out on top, then moved into the big time, joining with Sting & the Steiner Brothers against the Four Horsemen in a Wargames Match. Unfortunately, Pillman's team lost, when Pillman himself was taken out. Pillman next started a feud with Barry Windham, which included a violent "Taped Fist" Match at SuperBrawl. A few weeks later, Pillman challenged Windham to a "Loser Leaves Town" Match. The match became a tag-team bout, with Pillman joining with El Giante against Windham & Arn Anderson. It was a bad night for Pillman, as he was pinned and forced to 'leave' the company. Not long afterwards, the Yellow Dog appeared, wrestling for a few months. This run soon faded out. Pillman's true stardom hit with the creation of the WCW Light Heavyweight Championship at the end of 1991. In the tournament to decide the first champion, Pillman defeated Richard Morton in the finals to claim the gold. He would defend it against multiple challengers over the next two months, before losing it in a classic match with Jushin "Thunder" Liger, one of the best high-flyers to come out of Japan. Pillman would have a friendly feud with Liger for the next few months, and managed to regain the belt in another great match at Superbrawl II. Pillman stayed the Light Heavyweight Champion for the next six months, defending against Liger, Tom Zenk, and others, before finally dropping it to Scotty Flamingo(Raven). After a short feud with Flamingo over the belt, Pillman moved away from the Light Heavyweight division, intent on other endeavors. HE teamed briefly with his old foe, Liger, but the team never went far in the title ranks. Pillman's next big push came at the beginning of 1993, when he was brought together with "Stunning" Steve Austin as the Hollywood Blondes. The duo proved to be a great heel team, feuding with Ricky Steamboat & Shane Douglas, the WCW & NWA Tag Champs. In March '93, they finally managed to take the team down, winning the belts. For the rest of the spring and summer, the Hollywood Blondes dominated the tag-team division, keeping the titles despite challenges from Dos Hombres, the Four Horsemen, and other formidable tag-teams. In August '93, Pillman, injured, couldn't wrestle, so Austin chose Lord Steven Regal to help him defend against Arn Anderson & Paul Roma. 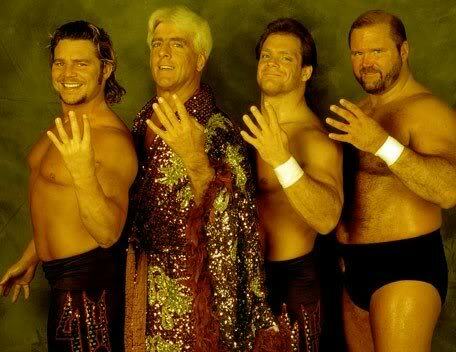 The members of the Four Horsemen won the match and took away the belts. Not long afterwards, the Hollywood Blondes broke apart, having a brief feud, caused by Col. Robert Parker, where Austin came out on top. Pillman later got his revenge on Parker, winning a match that made Parker have to dance in a chicken suit. Pillman continued to feud with Austin into 1994, joining with Sting & Dustin Rhodes in a "Thundercage" Match against Austin, Rick Rude & Paul Orndorff. Pillman's group came out with the victory, more because of Sting than of Pillman, but a win was a win. Pillman then had a short feud with the WCW Television Champion, Regal, before fading for a time from the title pictures. He was given different gimmicks to try, including a "California" surfer run that never caught on. It took Pillman developing a more crazy persona that brought his career back to life, becoming the "Ticking Time Bomb" and the "Loose Cannon of WCW". This got him a spot with Ric Flair's Four Horsemen, giving him a group to help him cause chaos in WCW. With the Horsemen, Pillman had a major feud with Kevin Sullivan, who, while part of the Dungeon of Doom, was also a booker with WCW. They fought in an "I Respect You Strap" Match, which had Pillman quickly telling Sullivan "I respect you, booker man!" Later on, Pillman was supposedly 'fired' by Sullivan. Whether he was fired from WCW or not is not known. Pillman did begin appearing on ECW, antagonizing Shane Douglas with talk about the Four Horsemen, but before anything came from that, a major crash threatened Pillman's future. On April 15th, 1996, Pillman was involved in a terrifying car accident that saw him flung over fourty feet from the car. His ankle was said to have been almost completely destroyed, as he nearly lost his leg. This put him out of wrestling for a good amount of time, keeping him out of the enviroment he desired. Pillman soon returned to television, appearing some in ECW in a wheelchair and stating his views. But this did not last long, as Pillman was later signed by the WWF. He made his first appearance at King of the Ring '96, and later joined the announcing team as a color commentator. For a time, Pillman worked as an announcer and an interviewer, until his former partner, now "Stone Cold" Steve Austin, attacked him with a steel chair, attempting to break his already-broken ankle. 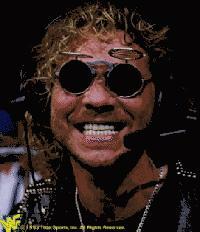 Pillman would disappear for a while, mainly to have reconstructive surgery so that he could walk again. In April 1997, Bret Hart began 'reforming' the Hart Foundation, bringing together his brother Owen and his brother-in-laws "The British Bulldog" Davey Boy Smith and Jim "The Anvil" Neidhart. Surprisingly, Brian Pillman appeared as well, allying himself with the heel Hart Foundation in the fight between Canada and the USA. At Canadian Stampede in July '97, the Hart Foundation took on Austin, Ken Shamrock, Goldust & the Legion of Doom in a war between countries. 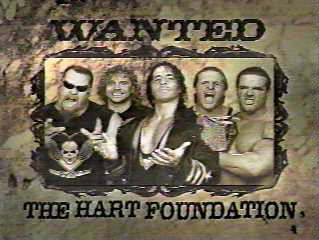 Since it was fought in Calgary, Alberta, Canada, the crowd was pro-Hart Foundation, putting the pressure on the American squad. In the end, Owen Hart pinned Austin, getting the Canadians the victory. Pillman would move on from this feud to battle against Goldust, which became a major skirmish when Goldust's woman, Marlena, became involved. At Summerslam, Pillman lost a "Loser Wears A Dress" Match to Goldust, being forced to don a golden dress for nearly a month. But Pillman got some revenge later on, winning at Ground Zero to win the services of Marlena for thirty days. He then entered a feud with Dude Love, and was set to meet him at Badd Blood in a Falls Count Anywhere match. Sadly, this was a match never to occur. On October 5th, 1997, only a few hours before Badd Blood, Brian Pillman was discovered dead in his hotel room. Although many reported that drugs played a factor in his death, it was later learned that Pillman had a previously undiagnosed heart condition, the same condition that had caused his own father's early passing. At 35, Pillman left behind a wife who was expecting his sixth child. It was a tragic loss for the wrestling world, as Pillman was finally looking like he would obtain the glory and fame that he so richly deserved. Where he could have gone in the future will forever remain a mystery. He inspired many to greater heights, even after his death, as wrestlers competed for many years at the Brian Pillman Memorial Shows. During a time when WCW and the WWF were in heavy feuds, they stopped and showed their respect for a great wrestler, by competing together for one night. It's a tribute that "Flyin" Brian Pillman deserved, as one of the pioneers of modern wrestling. - Stampede International Tag-Team Title Tournament (April '87) = Bad Company (Pillman & Bruce Hart) defeated Gus Jamieson & Dr. Shavago, Duke Myers & Kerry Brown, and Ron Starr & the Cuban Assassin to win the tournament. - NWA Great American Bash '89 = Pillman competed in a "Two-Ring King Of The Hill Battle Royal", which was won by Sid Vicious & Dan Spivey. Later on, Pillman beat Bill Irwin. - NWA Clash of the Champions VIII (September '89) = Pillman won over Norman the Lunatic. - NWA Halloween Havoc '89 = Pillman was pinned by the NWA US Champ, Lex Luger. - NWA Clash of the Champions IX (November '89) = Pillman once again lost to Lex Luger, who retained the NWA United States Title. - NWA United States Tag-Team Title Tournament (January/February '90) = Pillman & Tom Zenk won over Jack Victory & Rip Morgan, the Midnight Express and the Freebirds to win the tournament and the titles. - NWA Clash of the Champions X (February 6, '90) = Pillman & Tom Zenk defeated the MOD Squad. - NWA WrestleWar '90 (February 25) = Pillman & Tom Zenk kept the NWA United States Tag Titles, beating the Freebirds. - NWA Capital Combat (May 19, '90) = Pillman & Tom Zenk lost the NWA US Tag-Team belts to the Midnight Express. - NWA Clash of the Champions XI (June '90) = Pillman fell to Mark Callous. - NWA Great American Bash '90 = Pillman took down Buddy Landell. - NWA Running The Gauntlet (September '90) = Pillman won over Tim Horner and Buddy Landell, then lost to Dan Spivey. - NWA Clash of the Champions XIII (November '90) = Pillman beat Buddy Landell. - WCW Clash of the Champions XIV (January '91) = Pillman won over Buddy Lee Parker. - WCW WrestleWar '91 (February) = Pillman, Sting & the Steiner Brothers lost a "Wargames" Match to Ric Flair, Barry Windham, Larry Zbysko & Sid Vicious. - WCW/NJPW Super Show (March '91) = Pillman, Tom Zenk & Tim Horner fell to Shiro Koshinaka, Kuniaki Kobayashi & Takayuki Iizuka. - WCW Superbrawl (May '91) = Pillman lost a "Taped Fist" Match to Barry Windham. - WCW Clash of the Champions XV (June '91) = Pillman & El Gigante lost a "Loser Leaves Town" Match to Arn Anderson & Barry Windham. - WCW Great American Bash '91 = The Yellow Dog won, via DQ, over Johnny B. Badd. - WCW United States Title Tournament (August 25, '91) = The Yellow Dog fought to a Draw with Johnny B. Badd. Sting won the tournament. - WCW Light Heavyweight Title Tournament (August/October '91) = In the first round of the tournament, Pillman beat an unknown wrestler to advance. - WCW Clash of the Champions XVI (September '91) = Pillman beat Badstreet in the Light Heavyweight Title Tournament. - WCW Halloween Havoc '91 = Pillman defeated Richard Morton to become the first WCW Light Heavyweight Champion. - WCW Clash of the Champions XVII (November '91) = Pillman retained the Light Heavyweight belt, beating Johnny B. Badd. - WCW Starrcade '91 = Pillman & Bobby Eaton were beaten by Abdullah the Butcher & Sting. - WCW Clash of the Champions XVIII (January '92) = Pillman & Marcus Bagwell won over Terry Taylor & Tracey Smothers. - WCW Superbrawl II ('92) = Pillman won the Light Heavyweight Title from Jushin Liger. - WCW WrestleWar '92 (May) = Pillman stayed the Light Heavyweight Champion, beating Tom Zenk. - WCW Clash of the Champions XIX (June 16, '92) = Pillman & Jushin Liger defeated Chris Benoit & Beef Wellington in the first round of the NWA World Tag-Team Title Tournament. - WCW Beach Blast '92 (June 20) = Pillman lost the WCW Light Heavyweight Title to Scotty Flamingo. - WCW Great American Bash '92 = Pillman & Jushin Liger fell to Nikita Koloff & Ricky Steamboat in the second round of the NWA World Tag-Team Title Tournament. - WCW Halloween Havoc '92 = Pillman was beaten by Ricky Steamboat. - WCW Clash of the Champions XXI (November '92) = Pillman pinned Brad Armstrong. - WCW King of Cable Tournament (November/December '92) = Pillman fell in the first round to the eventual winner, Sting. - WCW Starrcade '92 = Pillman & Too Cold Scorpio lost to Barry Windham & the Great Muta. Later that night, Pillman & Barry Windham were beaten by the NWA & WCW Tag Champs, Shane Douglas & Ricky Steamboat. - WCW Clash of the Champions XXII (January '93) = The Hollywood Blondes (Pillman & Steve Austin) lost, via DQ, to the NWA & WCW Tag Champs, Ricky Steamboat & Shane Douglas. - WCW Clash of the Champions XXV (November '93) = Pillman was beaten by Steve Austin. - WCW Clash of the Champions XXVI (January '94) = Pillman won a "Loser Must Wear A Chicken Suit" Match over Robert Parker. - WCW Superbrawl IV ('94) = Pillman, Dustin Rhodes & Sting won a "Thundercage" Match over Steve Austin, Rick Rude & Paul Orndorff. - WCW Spring Stampede '94 = Pillman fought to a Draw with the WCW Television Champion, Steven Regal. - WCW Slamboree '95 = In a dark match, Pillman was pinned by Meng. - WCW United States Title Tournament (April/June '95) = Pillman defeated Bunkhouse Buck, then fell to Meng. Sting went on to win the tournament. - WCW Great American Bash '95 = Pillman fell to Alex Wright. - WCW Clash of the Champions XXXI (August '95) = In a dark match, Pillman won over Marcus Bagwell. - WCW Fall Brawl '95 = Pillman was beaten by Johnny B. Badd. - WCW Halloween Havoc '95 = Pillman & Arn Anderson lost, via DQ, to Ric Flair & Sting. - WCW World War III '95 = Pillman competed in the WWIII 3-Ring Battle Royal, which was won by Randy Savage. - Stampede Stu Hart Tribute Show (December 15, '95) = Bad Company (Pillman & Bruce Hart) won, via DQ, over Terry & Dory Funk, Jr.
- WCW Clash of the Champions XXXII (January '96) = Pillman took down Eddie Guerrero. - WCW Superbrawl VI ('96) = Pillman lost a "I Respect You Strap" Match to Kevin Sullivan. - WWF Canadian Stampede (July '97) = Pillman, Bret Hart, Owen Hart, Jim Neidhart & Davey Boy Smith won over Steve Austin, Ken Shamrock, Goldust & the Legion of Doom. - WWF Summerslam '97 = Pillman fell in a "Loser Wears A Dress" Match to Goldust. - WWF Ground Zero (September '97) = Pillman defeated Goldust, to win the services of Marlena for 30 days. - WWF Intercontinental Title Tournament (September/October '97) = Pillman took down Dude Love, then fell to the eventual winner, Owen Hart.